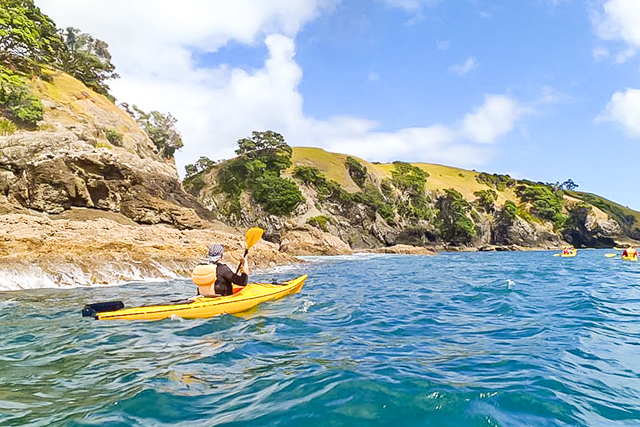 It is our mission to show you a piece of true Aotearoa with your trip with us, and it’s our goal to keep our sea kayak trips small and personal. 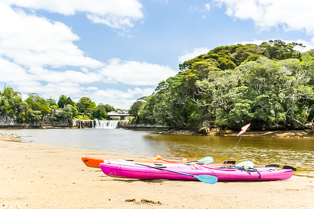 Come and join us on our 3 hour kayak tour up to the famous Haruru Falls. Haruru means “big noise” and we will get you right underneath these magic horseshoe-shaped falls to feel their full power. 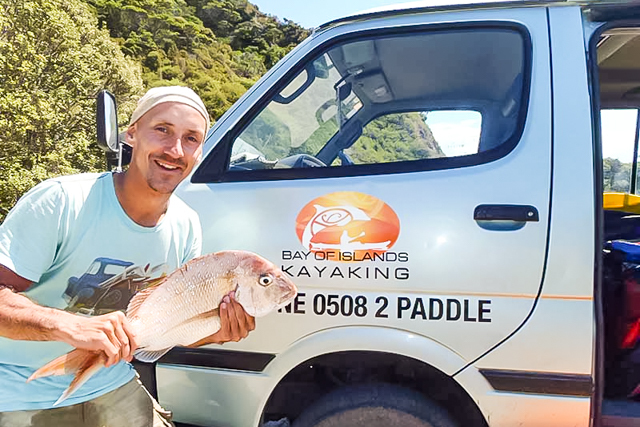 Our tour starts on the beach just north of the roundabout on Marsden Road, we meet everyone at the beach where we will have the kayaks waiting for you. 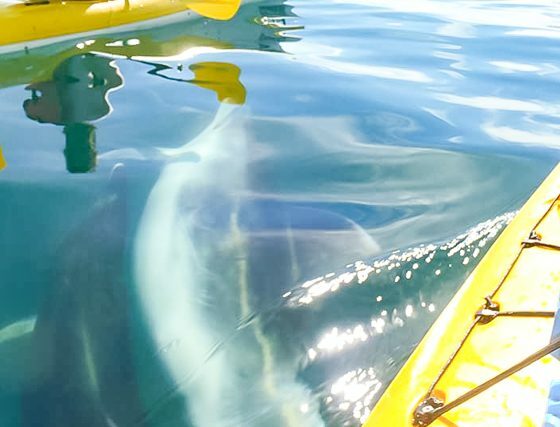 We use top of the line sea kayaks with rudders and spray skirts to keep water out of the kayak. After a little instruction we will head off up the river exploring the mangrove forests on our way to the falls. As we go we can spot nesting birds and old Maori Pa sites. When we get to the falls this is where we can really have some fun!Here we can get up close to the falls and for the more adventurous take a plunge under the falls. 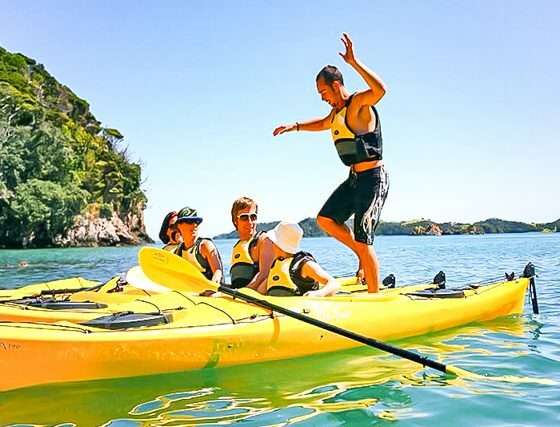 The Waitangi River is rich with history and Maori legend as your guide will tell you on the way. After a paddle under the falls we will stop for a break and refreshments before our paddle back down the river to where we started. N.B. KAYAKING THROUGH THE MANGROVES IS TIDE DEPENDANT! This is our newest tour option and it has been a long time in the making. 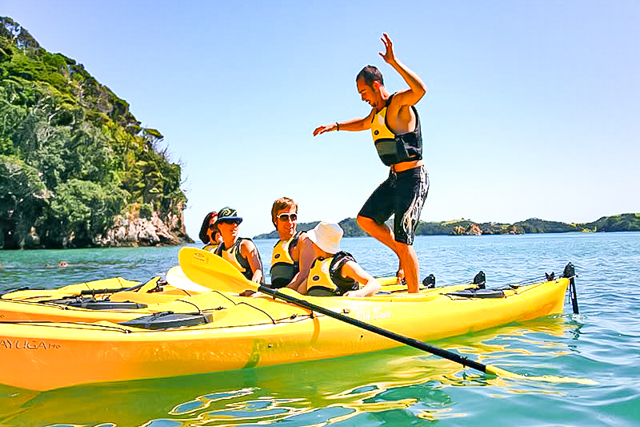 This is a perfect way to experience the Bay of Islands. 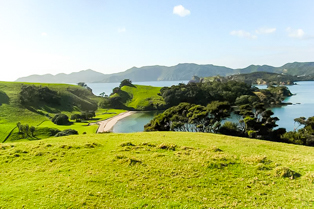 We get you out and into the middle of the main Islands to Otehei Bay with the ferry service from Explore. This in itself is amazing with great views on the 40 minute ride through the islands. 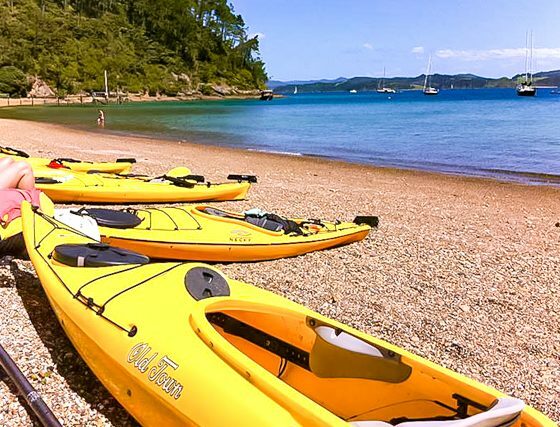 Depending on when you choose to get the ferry out to the island, you will either head out to explore the islands and beaches a little closer on your kayak tour or have time to check out Otehei Bay with its amazing beach, calm waters and spectacular views. 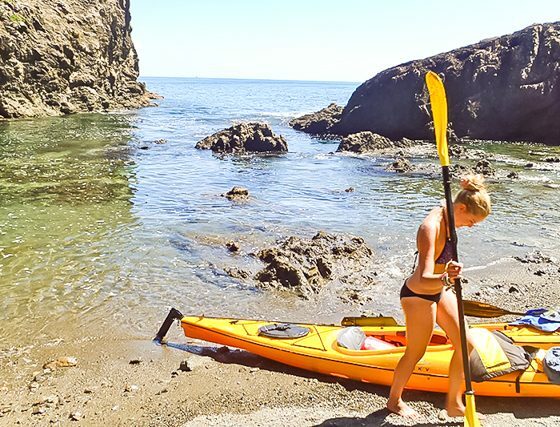 The best thing about this tour is you are already out in the islands so you do not have to paddle far to get to some breathtaking spots. We can paddle through rock gardens, check out caves and take in the amazing scenery. We will stop at one of the many breathtaking beaches the Bay has to offer, there is time to stop on our beach stop for an easy walk to amazing views of the Islands , a swim or snorkel in the clear waters before we head back. 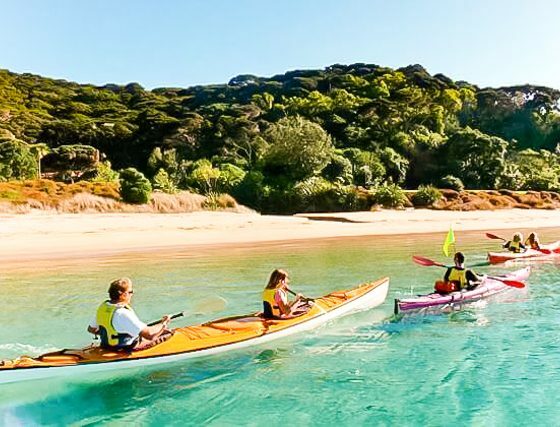 Before or after your kayaking tour there is a cafe/bar at Otehei bay where you can enjoy some delicious food and some refreshing beverages. 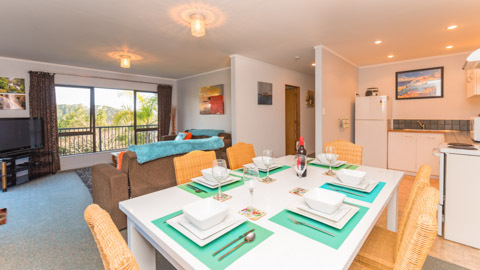 The area has tables and bean bags to enjoy and take in the breathtaking views. Also the Island has easy walks around to some cultural sites, beaches and spectacular views. Our 6 hour tour starts when we pick you up from your accommodation and head for the car ferry to Okaito (NZ’s first Capital). From here we have a scenic drive along the Russell peninsula to where we start. 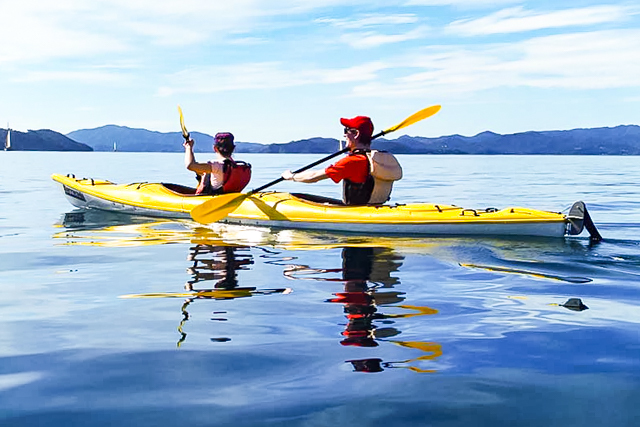 After we get comfortable with the gear and cover a few safety points we can get our kayaks on the water. The Islands of the Bay are surrounded by white sand beaches and rocky coastline. 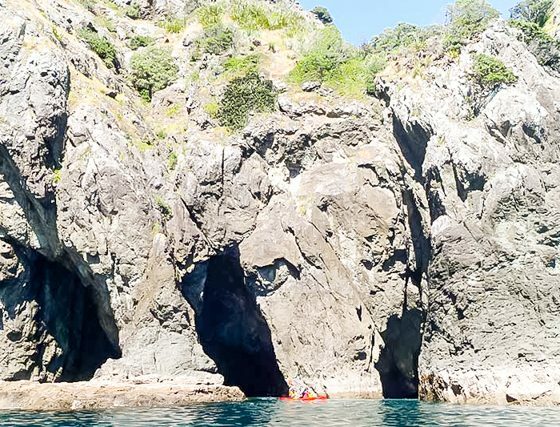 There are caves to paddle your sea kayak into and explore and the water is crystal clear. There are over 100 islands in total and each one is different. We can stop and snorkel at one island, chill out and have some lunch on another and take a walk and get some photos on the next. This is a full day out on the water so there is lots of chances to come across dolphins or other amazing marine mammals. 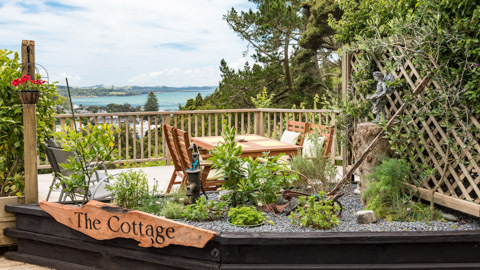 Your local guide will take you to the best spots and will spin you a few yarns about local legends and the rich Maori and European History. 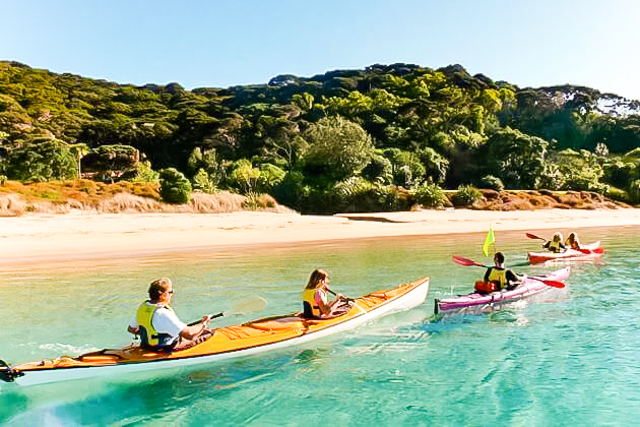 WE ARE THE ONLY KAYAK COMPANY THAT OPERATE DAY TOURS OUT TO THE OUTER ISLANDS….WHERE YOU WANT TO BE!!! The trip begins in the morning at Long Beach (Russell) and gets back at about 4pm the following day. 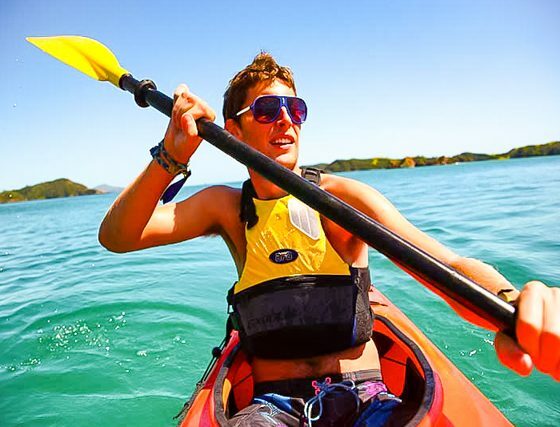 Our Two Day Sea Kayaking Tour is the Ultimate Mix of Adventure and Relaxation. Along the way we have plenty of time for exploring the Islands numerous caves and reefs, snorkeling (gear supplied) with the fish or even a spot of fishing. There are always Dolphins in the Bay of Islands and we often get to see them up close and in season even Whales. 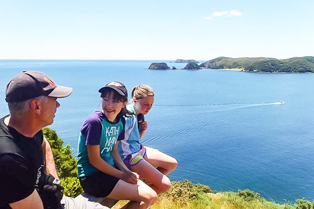 Numerous walking tracks on the Islands offer awesome views and a chance to check out many of the native birds of New Zealand (thanks to Project Island Song). With all this action we know you will be hungry, and we pride ourselves on keeping you fed and happy with delicious meals on all our trips. Nothing tastes better after a great day Sea Kayaking than a Gourmet meal and eating it on the beach as the sun sets on our campsite. We also know you don’t want to be spending your 2 Days in paradise with a wet blanket so we will give you a qualified and fun guide to show you the good spots! 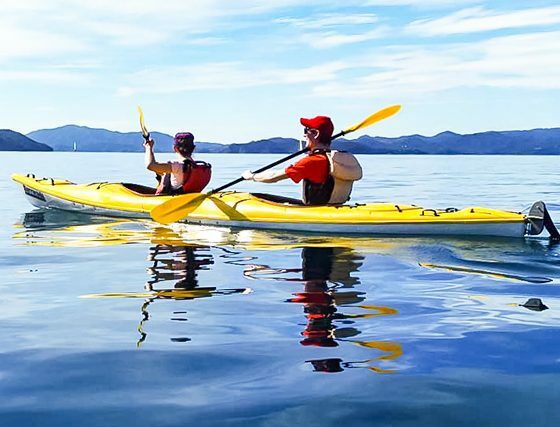 Also you do not get better views of the stars than out on the Islands and a short night paddle in the sheltered bay where we camp, with the glow in the dark of the phosphorescence in the water – will blow your mind! The trip begins in the morning at Long Beach (Russell) and gets back at about 4pm on the 3rd day. Three days out in the islands sea kayaking, snorkeling (gear supplied), fishing, walking and exploring in the kayaks and on foot! This is an adventure and is suited for the adventurous or those looking to test themselves a little. Our Three Day Sea Kayaking Tour is an extension of our Two Day Sea Kayaking Tour but with that extra day we can see so much more. We will take you to all the places and get to enjoy everything the Two Day Tour has to offer and lots more. 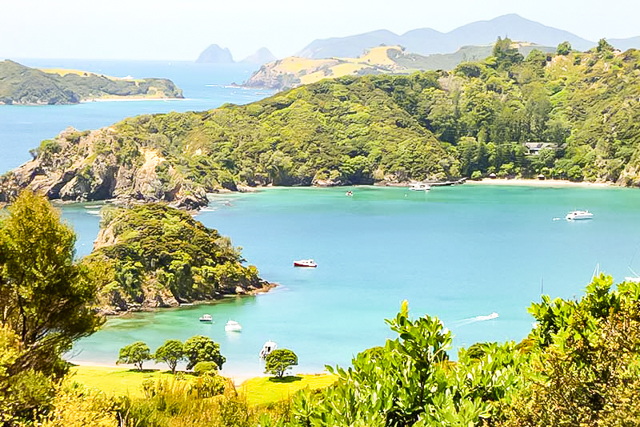 The extra day affords us the time to either have a relaxing day exploring islands close to where we camp or heading towards Cape Brett. 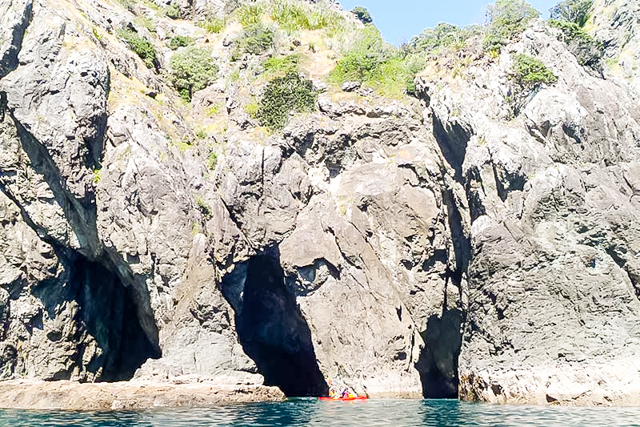 On calm days we have the opportunity to paddle to to the “Hole in the Rock”, paddle into Cathedral Cave or explore Deep Water Cove. 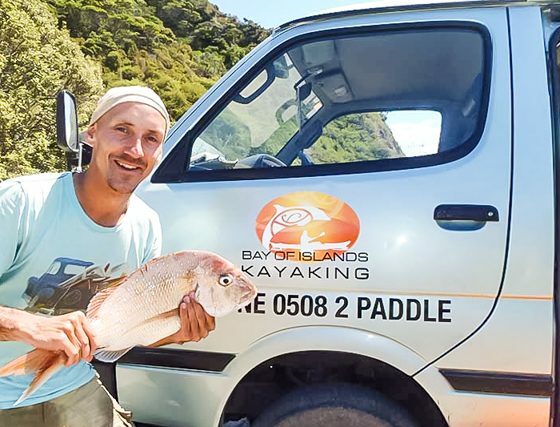 Another nice paddle is to stop in at Deep Water Cove where the Canterbury wreck is located and get some mussels at Oke Bay for an entree before dinner. 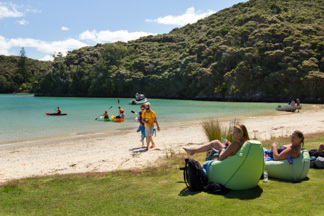 Along with the extra day of exploring you get an extra night camping on the islands. Dinner on the beach under the stars and a short calm night paddle in the glow of the dark, luminescent waters! 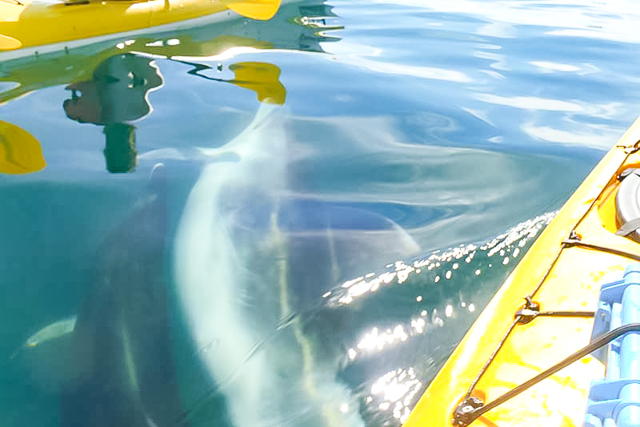 Our sea kayak hire option is for people wanting a real adventure! 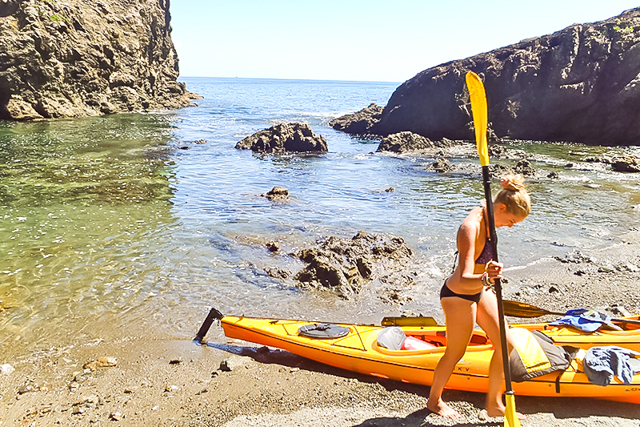 Freedom rentals are perfect for people that have outdoors or sea kayaking experience that are keen to explore on their own time. 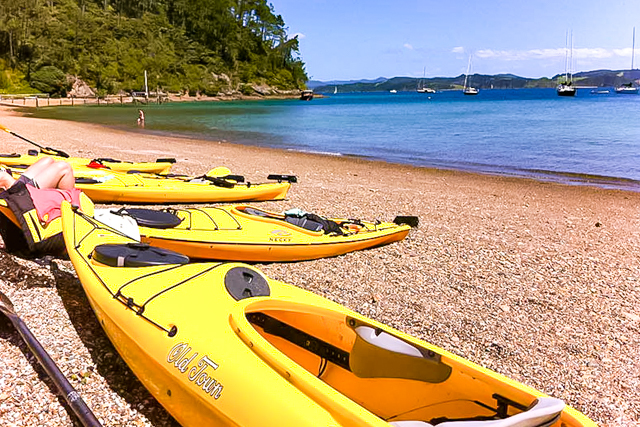 The Bay of Islands is the perfect place to rent a sea kayak with its sheltered waters, rich marine life and 144 islands. 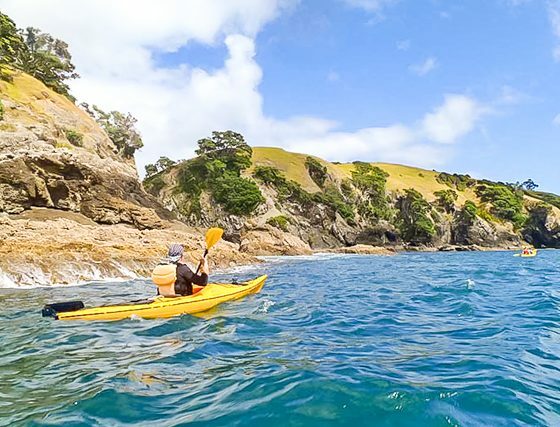 With camping available on Urupukapuka Island it is the perfect base to set up camp for multi-day kayaking trips and its easy to access everywhere from here. 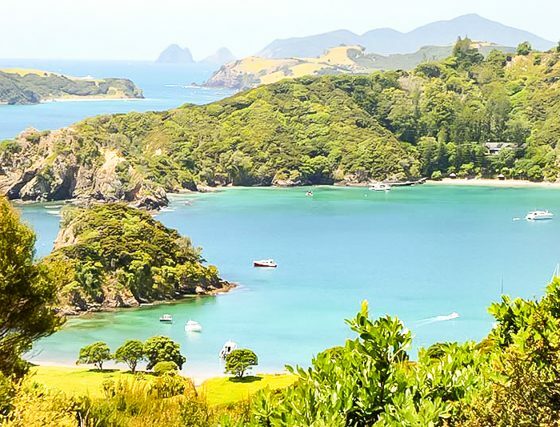 We provide pick-up and drop-off service into Paihia and can also drop off to Long Beach in Russell to get closer to the islands (for a fee). Before you set out we will give you a safety briefing about the gear and area. We will also explain about the wildlife and weather that you might encounter for the duration of your trip. 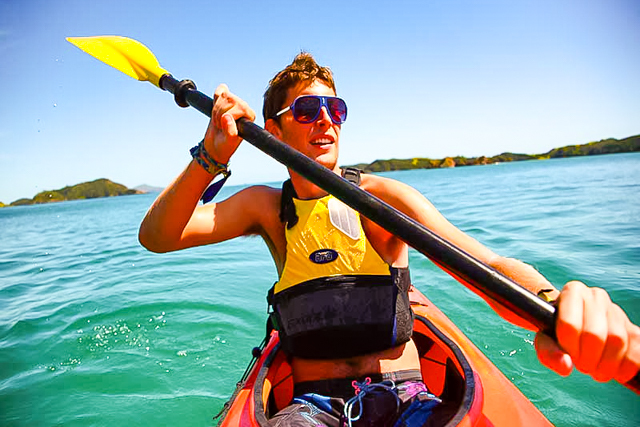 All sea kayak rentals require a minimum of 2 people for safety reasons and all people must be confident in the water.